Delves-Deeply is an Argonian and a former mage of the Ebonheart Pact found in the ruins of Quendeluun. She decided to leave after being mistreated by Dunmer who still believed in slavery. "You're an unexpected bend in the river. Not Veiled Heritance, yes? And obviously not Pact. Perhaps we may be of service to one another?" Aren't you a member of the Pact? 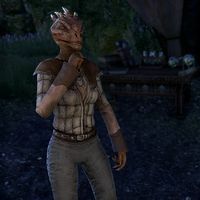 "Argonians as a people are, yes. But these troops are no friends of mine. I want to teach these pigs a lesson. I help you, you help me?" "This crystal, take it. The Pact has unloaded arcane cargo all around the cove. Simply touch the crystal to the cargo. The results should be... impressive"
"Careful. The crystal has a bite. Not always so friendly when unattuned." "Yes. The crystal may backfire if not properly attuned." Is this something I can get some help with? "I can't. My magicka is bound. I could try, but if I exceed the power the stone allows me... pain. (Intimidate) I don't want to brag, but I'm pretty good at hurting people. "I see I've chosen another trustworthy ally. "My people are allied with the Dark Elves. Our slavemasters are now our friends. And yet, nothing has changed. I'm still treated like a slave. I should be free to flow as the river's course demands." Aren't you a mage? Why don't you just leave? "My magicka is bound. My superior, he holds a gem that contrains my power. You destroy their supplies, yes? I gain my freedom." Return to her after completing the objective. "Excellent. So now you see—this gem dampens my magicka. The crystal I gave you, along with a bit of spellwork, should set me free." "I will start the spell. Once I have the crystal weakened, I will tell you to use the crystal I gave you. Using it will be the final boost I need. Then I shall be free. Ready?" She prepares the spell and says, "This should work... Now use the crystal on the stone." Do as she asks. "Leave these pigs to your slaughter. May they rot. Thank you for your help. Shadowfen awaits!" This page was last modified on 15 October 2017, at 15:52.